One of the advantages (or disadvantages) of a cottage near the WHR is that you get to see the trains a lot. Although, with the two Garratts running the service most of the time, what you actually see is the same trains a lot. 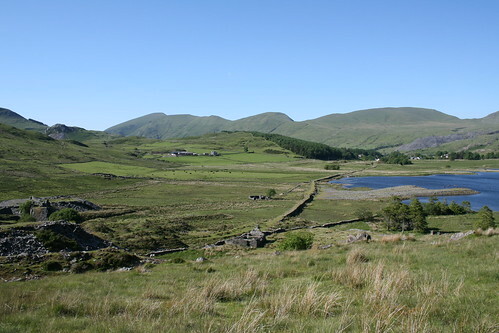 Even so, even a short walk around the nearby hills will usually result in a view of varying distance of No. 87 or No. 143 138 in action. Of course as you go up the hill, the trains tend to get smaller. 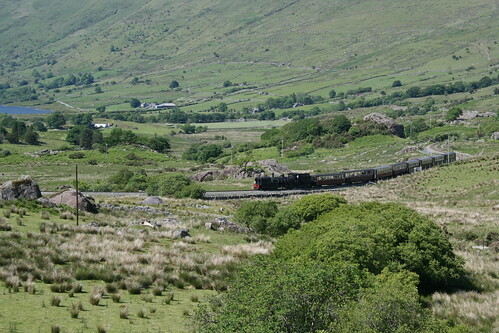 This is the view from the Rhyd Ddu path up Snowdon as 143 138 returns with a train to Caernarvon, although on this occasion we turned away from the big mountain a little further on and descended back to the summit of the line and Pont Cae’r Gors to explore the Beddgelert Forest. Turns out the footpath on the map was reflected quite so well in the footpath on the ground, but once through the forest we found another derelict quarry site although this one was much smaller than Glan-yr-Afon and heavily overgrown. You can see down by the lake a substantial causeway which must have been an intended connection to the railway. Up on the grassed over spoil tips there were a couple of hints of tramway rails, but the ground behind this viewpoint was too boggy to explore any further into the workings (at least with my trainers on). Past the quarry the path visibility wasn’t much better. We didn’t quite have to resort to trespass but this is clearly not a well trodden route. A shame, as you could easily spend a lot more time looking around these old sites. And the final benefit of the walk talking longer than planned? 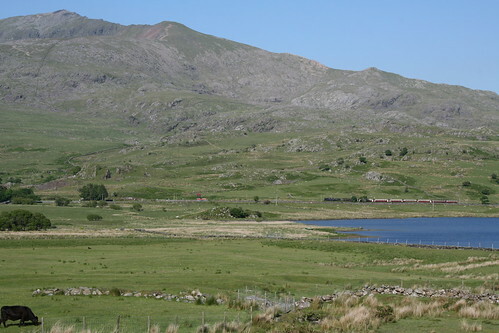 A long shot over the lake of 87 approaching Rhyd Ddu with the final return train of the day. This entry was posted in 2' gauge, industrial, narrow gauge, welsh highland railway. Bookmark the permalink. Red garratt is 138! 143 is in bits at bl and dinas. May be back for august. 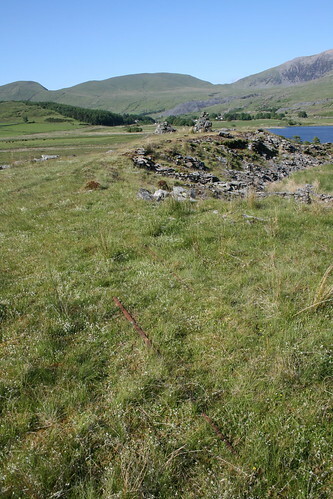 You are correct in that the causeway from llyn y gadair quarry was to connect to the railway but never did! You have been blessed with the weather! I must admit I'm a little jealous of your holiday! 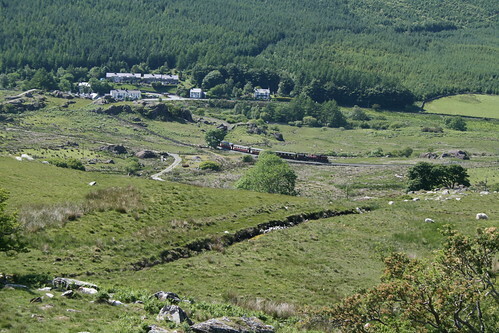 I'm hoping to get back there at some point – the Welsh Highland Railway is an amazing project! Hope you have great holiday!